Navy SEAL, Santino “Hunter” Lozano is ready to settle down. The problem is finding a woman suited to the long separations and hardships of a military wife. When Hunter meets Celia West, he believes he’s finally found the woman. A smart, beautiful Department of Defense contractor, Celia conducts “after-action” interviews with Special Operators giving her special knowledge of the demands of his job. She also understands there are things about the job he can never share. Celia has long wondered what the secretive Spec Ops men are like away from the job. When the hot and mysterious SEAL asks her out, she accepts thinking there might also by some fun time between the sheets. Hunter soon makes it clear wants more than fun time. He’s determined to have Celia in his life and he sets about to make it happen. Celia’s personal and professional life is a complicated tangle of dark secrets and she can’t afford to let anyone close. Not even Hunter could protect her should the violent problems of her past reappear. 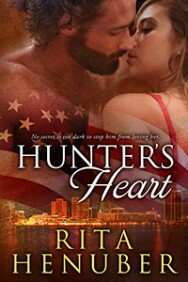 Celia gives in to deeper feelings and Hunter sweeps her into a life of love, family and loyalty she thought she could never have. And maybe she can’t. To be with Hunter Celia realizes she must share her secrets. At least some of them, for telling all would place him in more danger than he’s ever known and she would surely lose him.